I’m not back to selfish sewing yet. 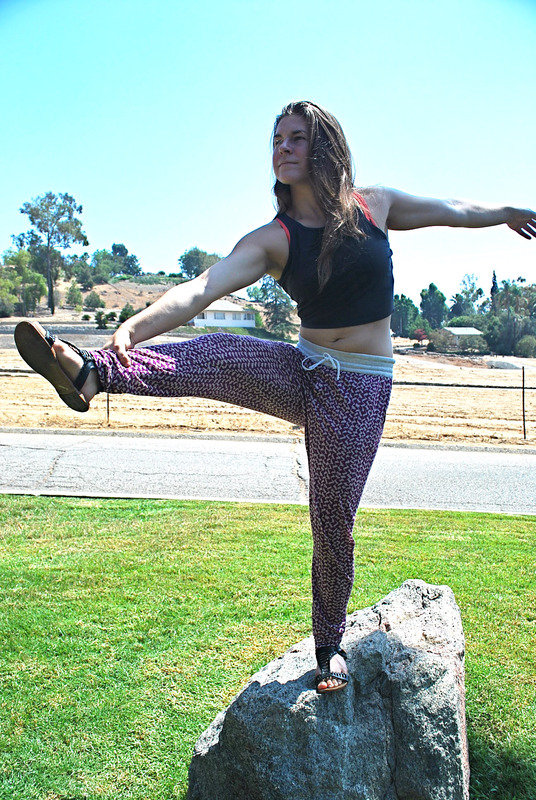 I stumbled upon a competition using New Zealand indie company, Papercut Patterns “Anima Pant.” So Hanna wins out again with this modern, sport pant for Fresh Make #14. 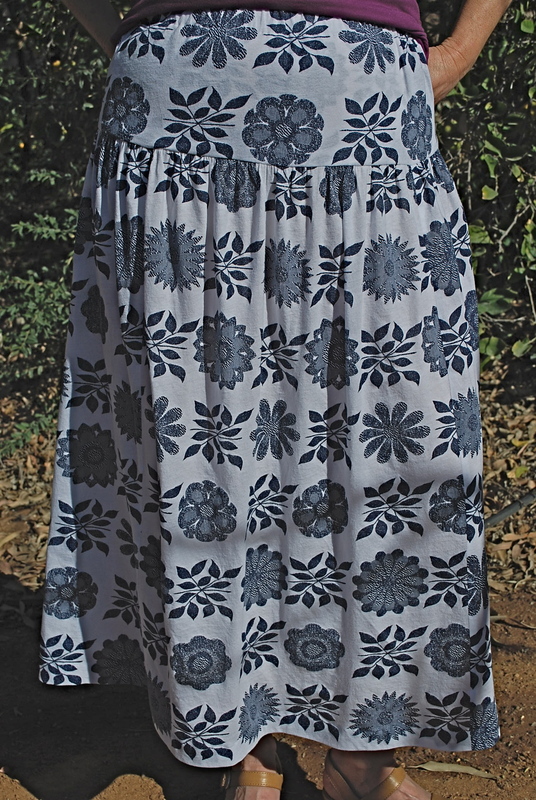 This is my second indie pattern (I made the Moneta dress on my previous post.) I was convinced to purchase Papercut’s Anima Pant when they were offering 20% off the $25 price, plus free shipping (all the way from New Zealand!). And I have to say it arrived sooner than I expected. It comes packaged in a nifty cardboard, hanging envelope. The pattern comes with different length options. The competition is co-sponsored by The Fabric Store. Their only U.S. location is only La Brea Avenue in Los Angeles. Lucky us! A great excuse for Hanna and I to go into the city, and also stop in for a delicious drink and yummy goodie directly across the street at The Sycamore Kitchen. Hanna had free reign in the fabric selection. I always like to see what my art student daughter will choose. 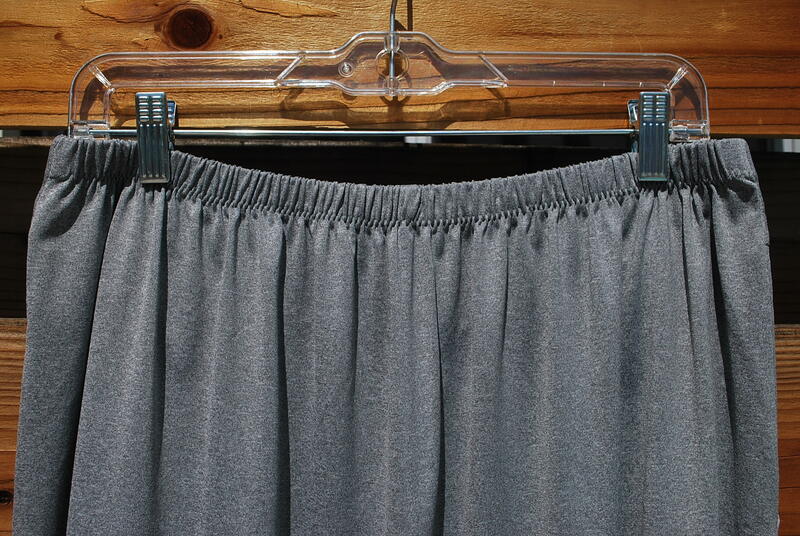 The fabric is a beautiful, drapey, single knit jersey. I regret to say that I’m not sure of the fiber content. It looks and feels like a cotton/rayon blend. I pre-shrunk it in the washer and dryer, and it came out beautifully. We bought 1 1/2 yards at $12 per yard. 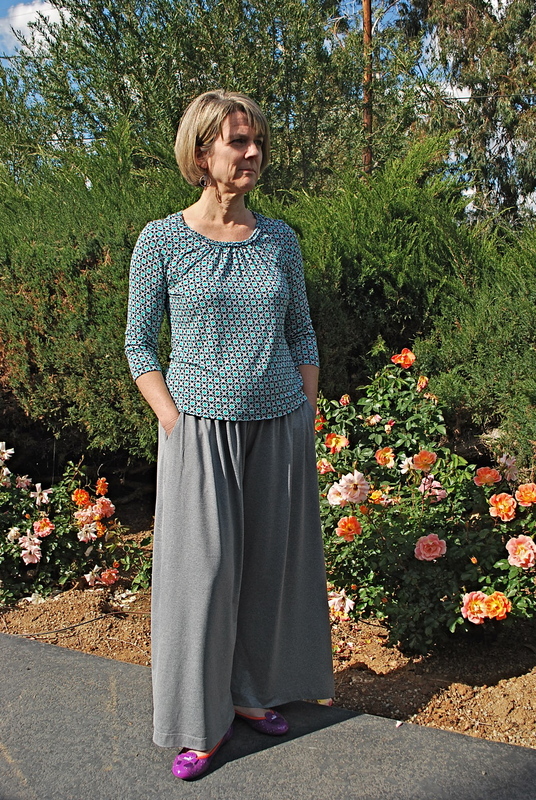 Hanna also chose a waffle ribbed knit for a contrasting waistband. 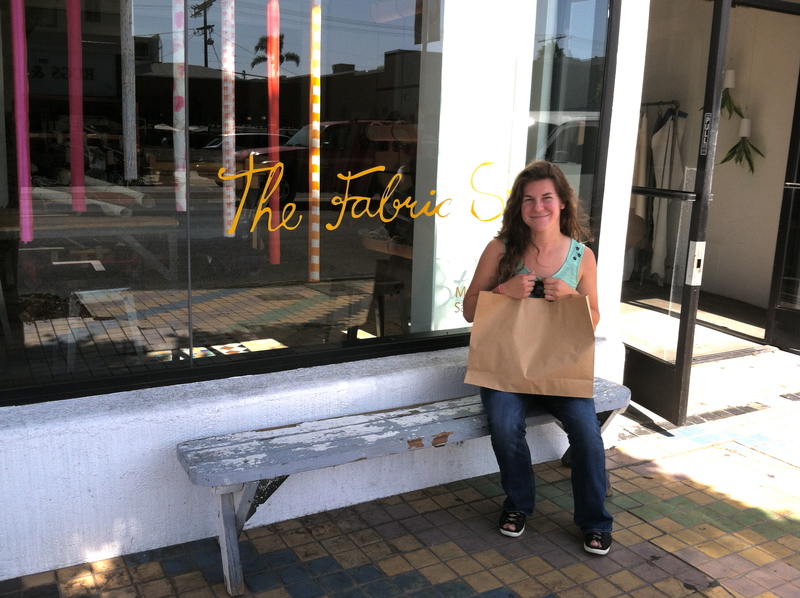 Fabric in hand on La Brea Avenue. 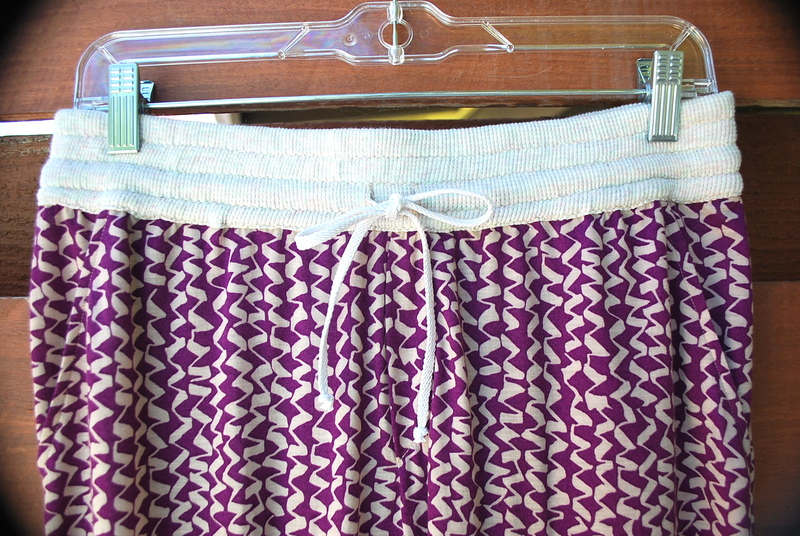 The waistband is made with 2″ wide elastic and a drawstring. My buttonholes did not end up in the middle of the waistband, so I put an extra row of shirring at the top, different from the pattern instructions. I sewed the seams with my regular machine and then serged them together. The pants have 4″ cuffs at the leg bottom. 2. Besides cutting in-between sizes, the only adjustment I made to the pattern was on the leg length. Hanna’s legs are on the shorter side, so I took off 2″ with a pattern adjustment before cutting out the fabric, and another inch at the bottom once she tried them on before attaching the cuffs. 3. I wrote quite a bit about pattern instructions on my last post about the Moneta Dress, so I won’t repeat a lot of my comments here, except that I feel the same way about this pattern’s instructions. It has a fun graphic presentation printed on brown paper bag like paper. But again, just like on the Colette pattern, and many of the big 4 patterns, the details just aren’t there for the novice sewist. 5. I have to say again that this a fabulous, modern, fresh, knit pant pattern. It drapes perfectly on Hanna. The leg width is perfect too. I know for a fact that Hanna will be wearing these pants a lot when she returns to her college campus this fall. Sometimes when I am going out, I want to pull on something quickly, be super comfortable, and still feel like I’m wearing something unique and stylish. 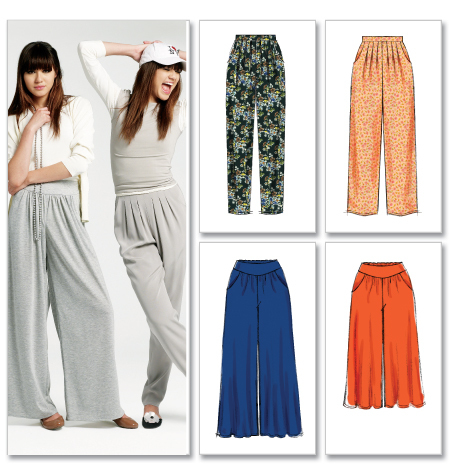 I decided to make a casual pair of wide-legged pants as an interesting alternative to jeans for Fresh Make #6. 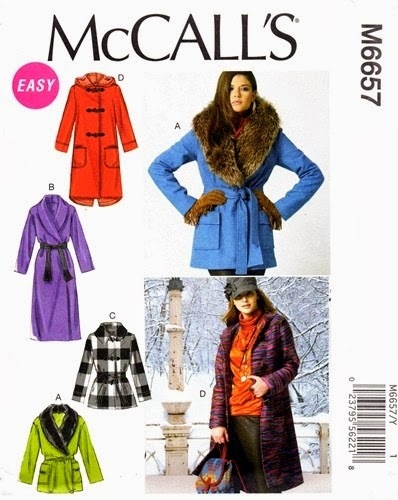 The pattern I choose was McCall’s 6514. I purchased this pattern for $1.40 as part of a 5 McCall’s patterns for $7.00 sale. 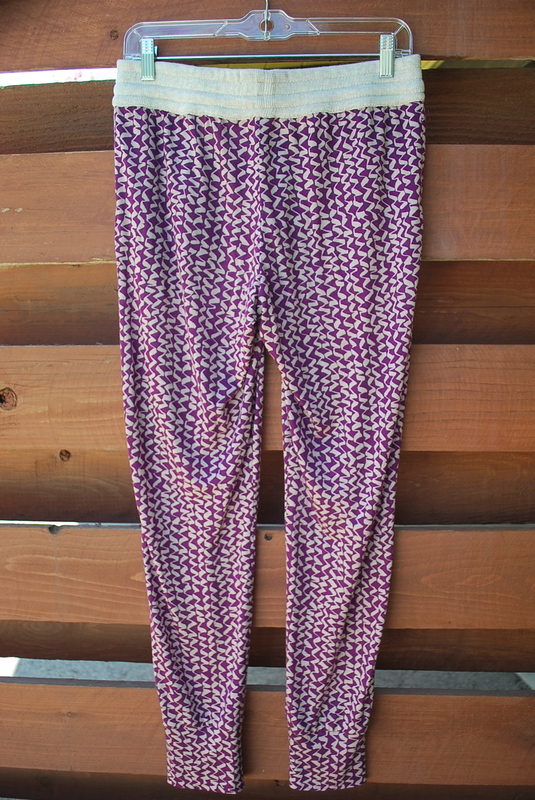 I named this pattern My Chill Pants because these pants seem like a something you might pull on when you are going to just lounge around with friends. Or when you are going out to dinner and don’t want to feel constricted after a great meal. I have to admit that I rarely shop for fabric at JoAnn’s. It is the only fabric store within miles of my house, and sometimes as a last resort I need buy fabric there. The fabric for this project was purchased at JoAnn’s because I was under a time constraint, and, I have to say I really like it! 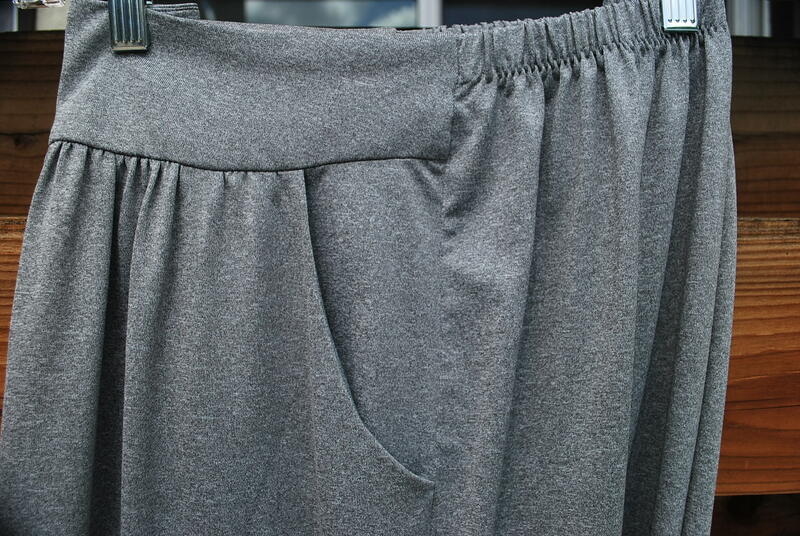 It is a light weight polyester knit with smooth feel and nice drape. I actually had these pants stuffed in a suitcase for 10 days, and when I unpacked them, they barely had a wrinkle. The fabric cost $10.49 on sale per yard. The pattern requires 2 3/8 yards. There is a front yoke. The back waist is elastic. The front and back come together like this. My favorite way to hem knits is with a double needle. 1. This pattern had no surprises for me! 2. This pattern is labeled EASY. I would say that a fairly accurate label, accept for the waist band features. Sewing the side seams together at the waist was a bit tricky, and the front yoke requires hand stitching on the inside facing. 3. The front yoke piece is the only area where fitting is crucial because it needs to hit exactly at the middle of the sides of your waist. I cut that piece exactly between the size 14 and 16, and it worked out perfectly. The legs are so full, it doesn’t really matter what size you cut! 4. The only alterations I made to the pattern pieces before cutting was I took 1 inch off the crotch length and 2 inches off the hem length. Since I’m not the tallest person in the world, I ended up cutting off a few more inches off the bottom of the legs when I hemmed the pants. Overall I am very happy with my Chill Pants. They couldn’t possibly be more comfortable or easy to care for. I’m going to wear lots of skirts this spring and summer. Enough of those jeans shorts. 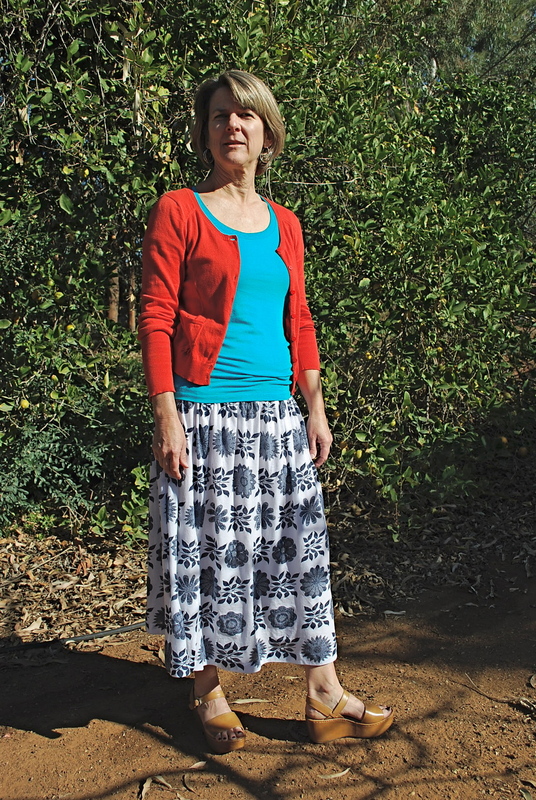 I’m adding a second skirt to my stylish handmade collection for Fresh Make #5. 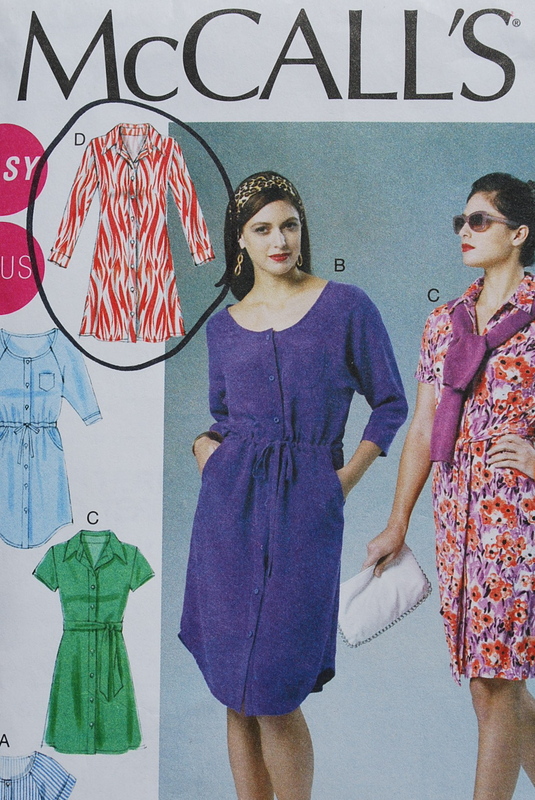 The pattern I choose was Simplicity 2416. I purchased this pattern at JoAnn’s Fabrics for $1.00 during their 5 Simplicity patterns for $5.00 sale. 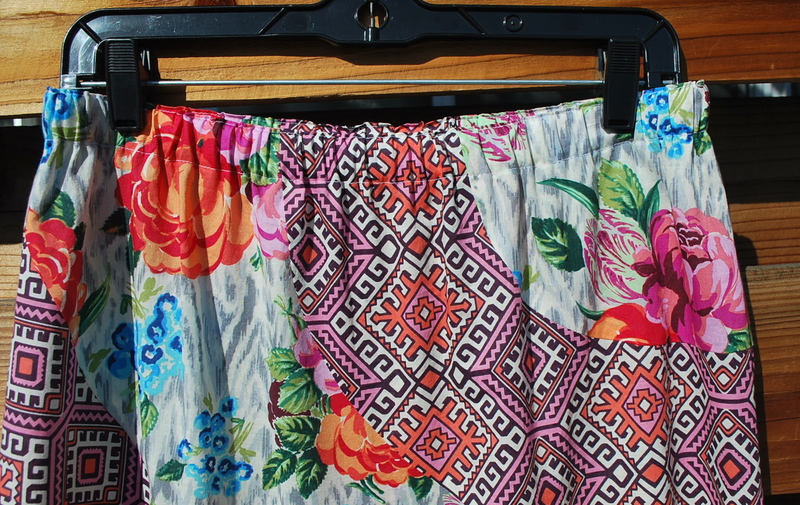 I like this pattern because it has a retro 70’s vibe and it seemed like it would be a fun, feel good skirt to wear. 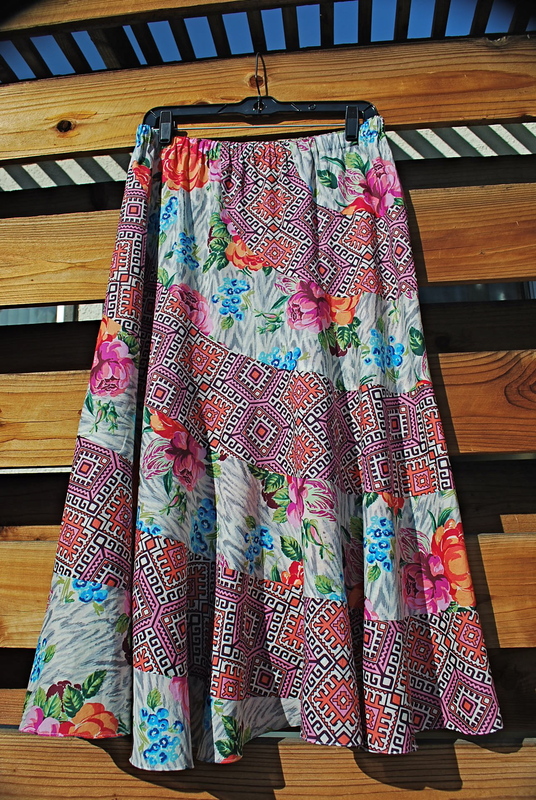 I named the pattern The Festival Skirt because I could imagine a groovy gal frolicking around in a swirl skirt like this a summer music festival. I am in love with the fabrics I choose. They are from Amy Butler’s Hapi Voile collection, purchased from my favorite online fabric store, Hawthorne Threads. This cotton voile is amazing. 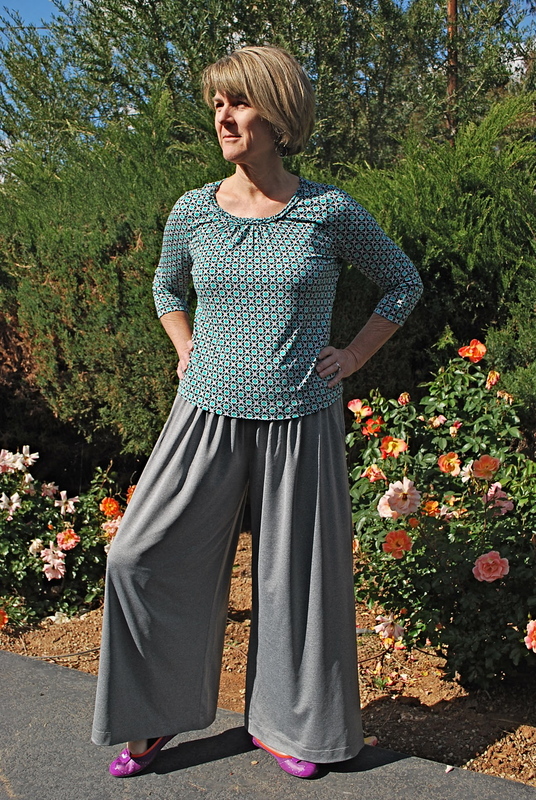 It’s smooth and lightweight with a beautiful drape – a delight to sew with. The cost for this fabric, including shipping was $58.50 and worth every penny. 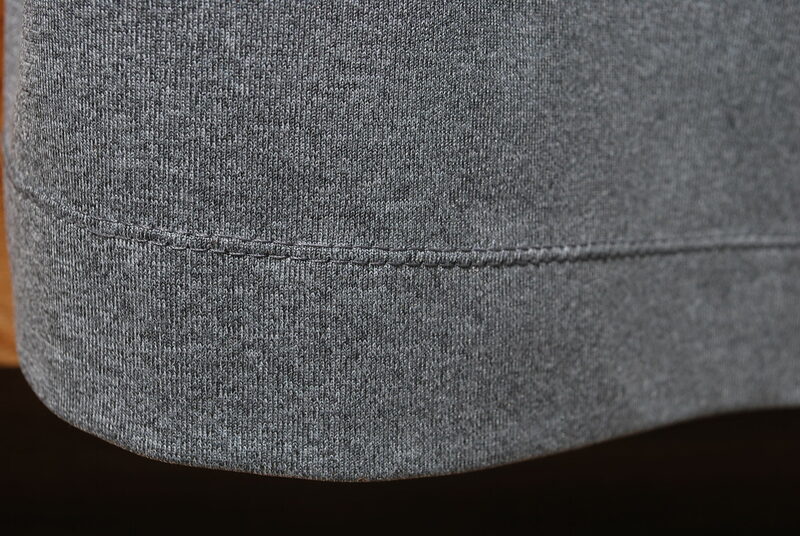 There’s a simple elastic casing at the waist. I overlocked all the edges together and did a rolled hem. 1. The pattern pieces, all seven, are just a series of swirls (or flounces as they are referred to in the directions), it is viturally impossible to measure the pattern pieces for fit before cutting out the fabric. So with my new updated knowledge about my measurements, I simply cut a size 16. 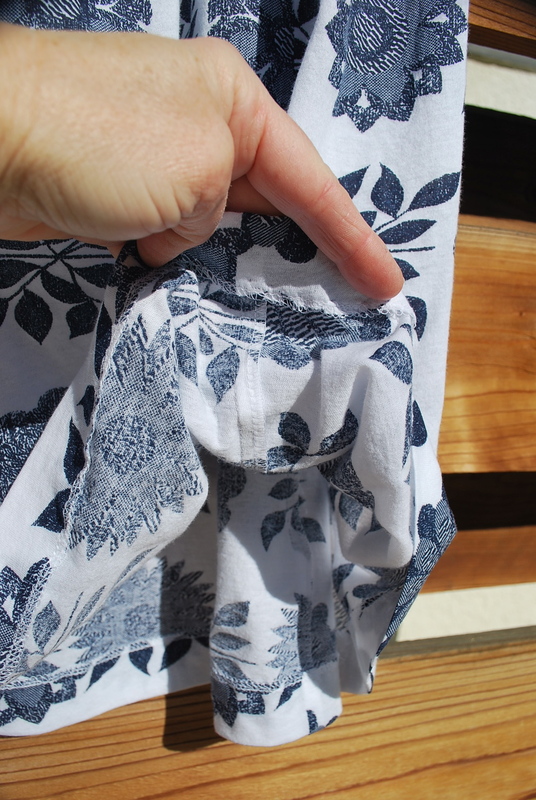 Always error to the larger size – you can always trim off fabric, but you can’t add on. Right? It turns out it fit fine. I probably could have gotten away with a 14, but for me, there’s nothing worse than fabric pulling across the tummy. 2. 54″ vs. 6o” I ran across this same issue with The Instead Top. 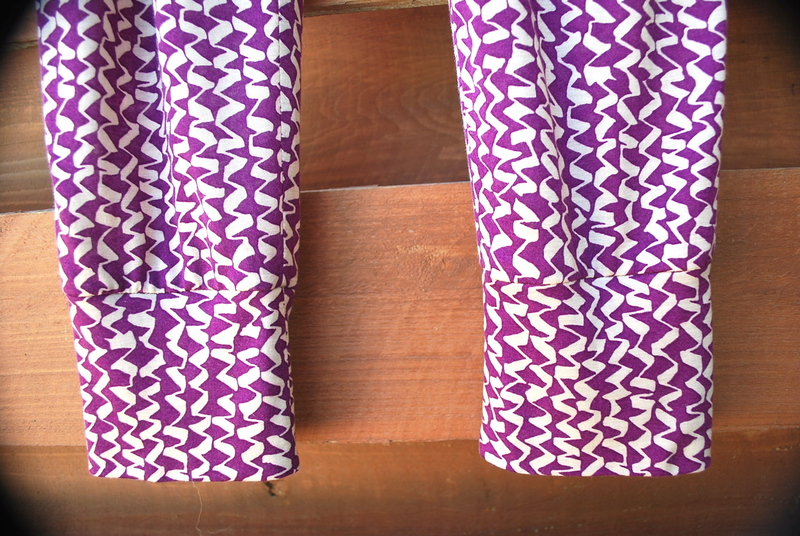 The pattern envelope gave yardage amounts for 45″ and 60″, but this Amy Butler fabric is 54″ wide. 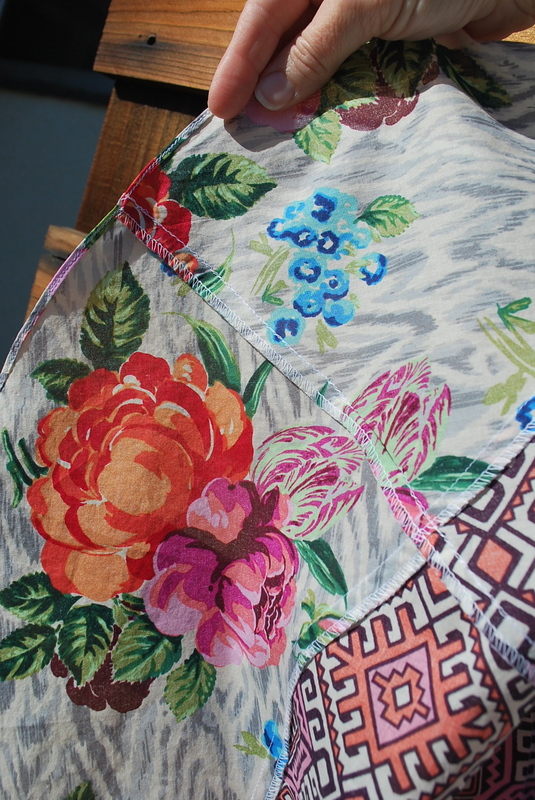 Again, I thought it would be fine to buy the specified amount for 60″, but I ended up having to do some “creative” manipulations of the patterns pieces to fit them all on the fabric. I would definitely buy at least an 1/8 of a yard more of each fabric if I were to repeat this project. 3. Interesting hem. The directions instruct you to hem the second to last flouce before sewing on the last flounce. (The hem is split between the two contrasting fabrics.) This resulted in curve that I’m not sure I care for. 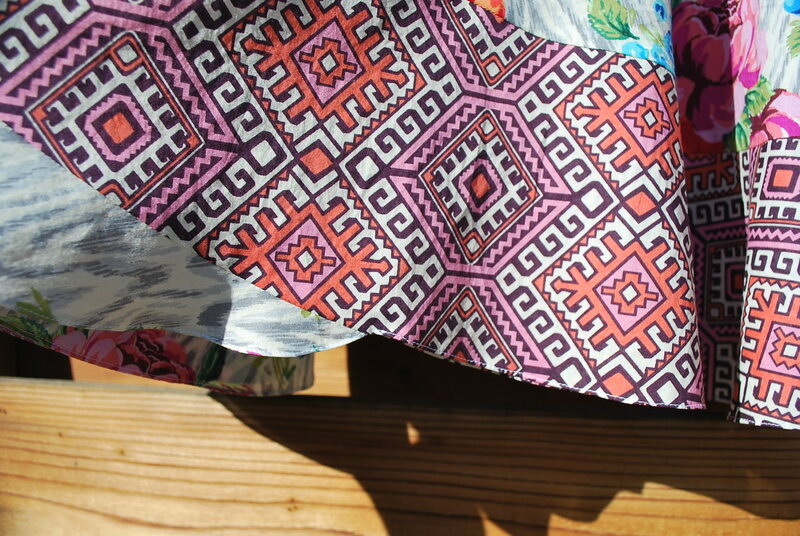 This flouce (the flower print one) also dipped more in one spot, creating a bit of an uneven hem. But, hey, maybe I shouldn’t let that bother me. The photo on the pattern envelope kind of looked that way too. 4. I did “raise” the skirt a bit. I anticipated that the skirt would probably be too long, but also knew it would be tedious and risky to mess with the swirl pattern pieces to shorten the length. 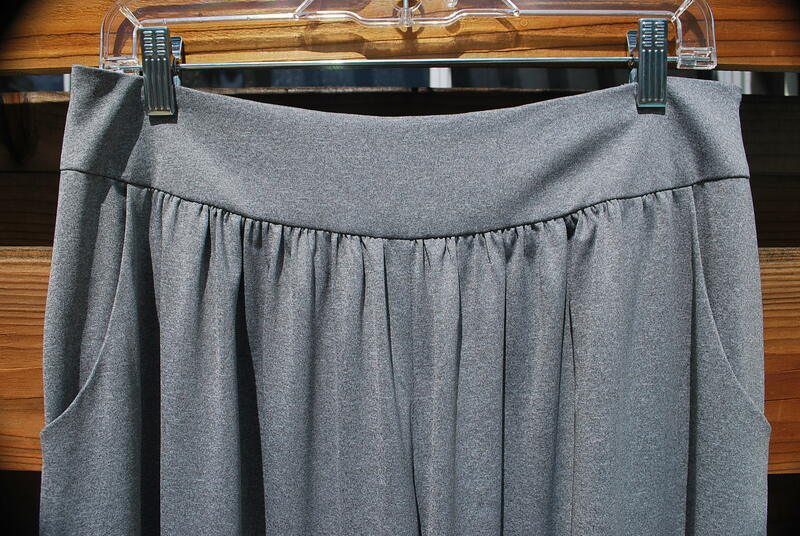 After completing the hem but before doing the elastic casing, I tried it on and determined that I would cut off 2″ from the waist to shorten it. This adjustment was minor enough that it didn’t affect the fit or look of the skirt. Overall, I am completely enamored with the skirt! 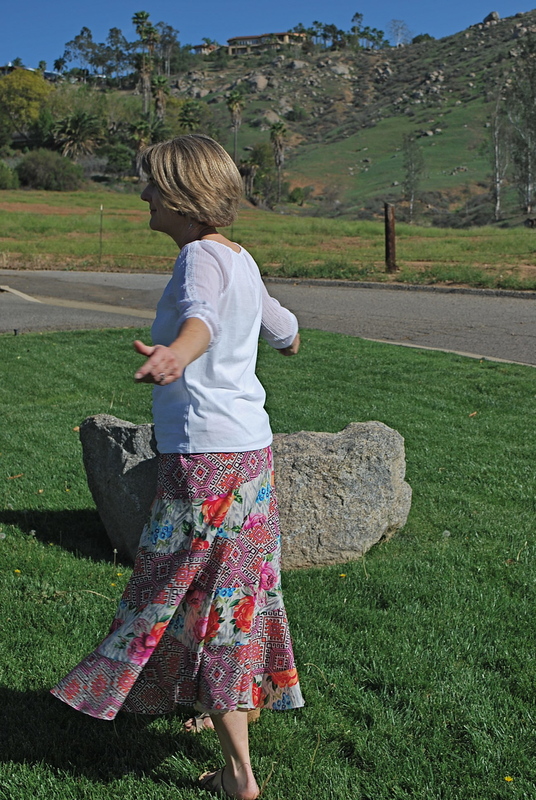 And I highly recommend the Amy Butler cotton voiles if you choose to make a Festival skirt. I haven’t had a shirtdress in recent memory, and definitely not one in a slinky knit. Since this is my year for trying new things, Fresh Make #3 is a knit shirtdress. I used McCalls 6520. I purchased it at JoAnn’s Fabrics as part of my recent bunch of 5 McCalls patterns for $7. I have named this pattern The Carol Dress in honor of TV’s favorite 70’s mom, Carol Brady. I know her collars were more exaggerated and her hems were shorter, but this shirtdress style definitely hints back to that era. 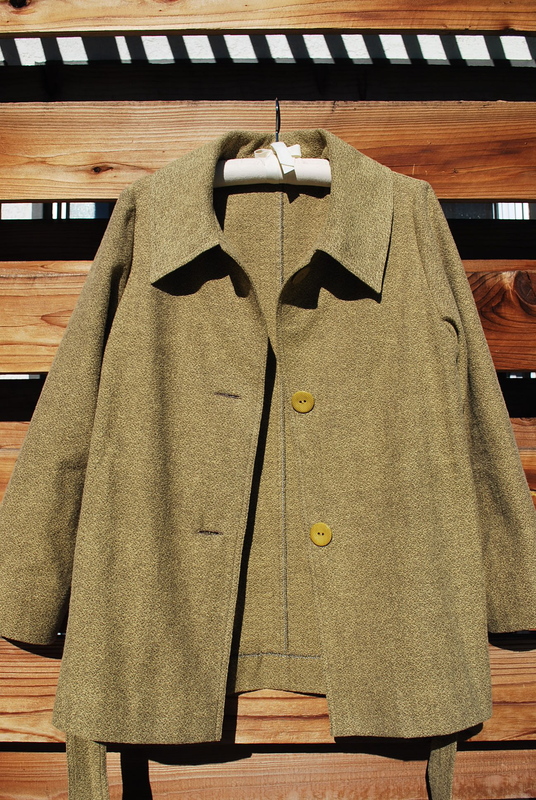 I bought the fabric at Michael Levine’s in downtown L.A. on the same trip that I bought fabric for The Tina Jacket. The total cost for this project is truly something to brag about. I bought two yards of 60″ fabric for $5.00 per yard for this project. $10 for fabric + $1.40 for the pattern + $1.60 for buttons + $4.00 for interfacing + $1.95 for thread < $20! I don’t focus too much on cost for my projects because I sew for many other reasons, but the low cost for this project was worth mentioning. I can’t remember the last time I did a collar with a band. But it’s like riding a bike, you never forget how. 1. This McCalls pattern is rated EASY. 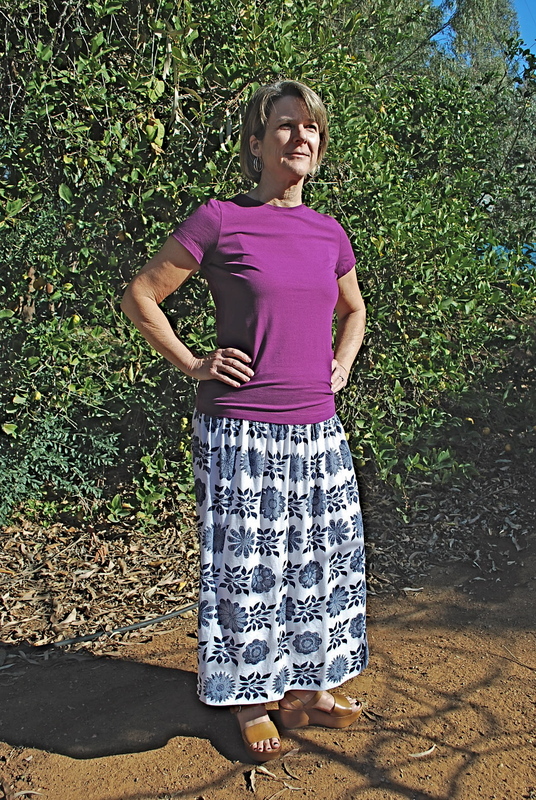 While this may be a simple version of a shirtdress, NO shirtdress pattern is recommended for beginners, especially one that is designed for knits only. Features such as collars, plackets and buttonholes are best practiced on woven fabrics first. 2. A word about working with this knit fabric. This synthetic knit is very stretchy and requires some slow and patient sewing. I found that I needed to hand-base about 3/8″ from the edge first before I topstitched around the collar to prevent the fabric from stretching on the top layer. 3. Numbers rear their ugly head again! Like with The Jean Skirt, the size that matched my measurements sounded way too large for me. I cut a size 14 on top and at the waist transitioned to a size 16! Wow! Just numbers, right? Last week I bought a pair of size 8 jeans at Ann Taylor. Oh pattern companys, why can’t you flatter us like Ann? 4. I’m not always the expert I think I am. I pride myself in taking the time adjust the pattern pieces to my measurements before I cut the fabric and also fit as I sew. I took 3/4″ off the length of the sleeve pattern and thought that would be fine. Well maybe the fabric stretched with the weight of the cuff, or I have really short arms – but the sleeves came out about 2″ too long. They bunched at the wrist and I knew I would not wear the dress like that. So I decided the best solution was say good-bye to an hour or so of hard work and simply cut them off! 5. Shh! Big secret. I’m wearing a slip and shape wear in these photos. You got to hide the bumps and bulges when wearing a slinky knit! Overall, I am very happy with my Carol Dress, and I am pleasantly surprised at it’s flattering fit. Thanks for taking the time to read this post. I welcome your comments and questions. I was tired of putting on the same fleece jacket I wore to high school track meets to go out for a casual dinner or an evening movie, so I decided Fresh Make #2 would be a jacket. I had a ton of fun making this jacket. I had not done a collar with a lapel in years. 1. 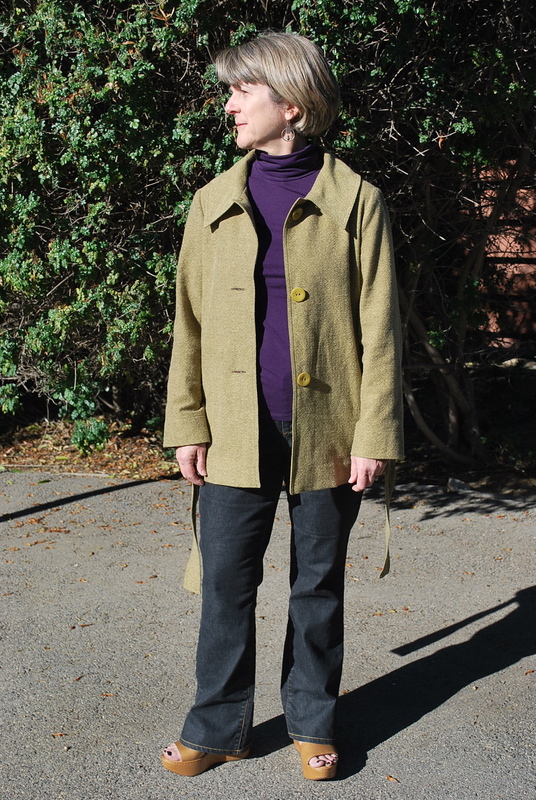 This McCall’s pattern is rated “EASY.” In the world of jacket and coat making it is easy, but it is not a beginner sewing project by any means. 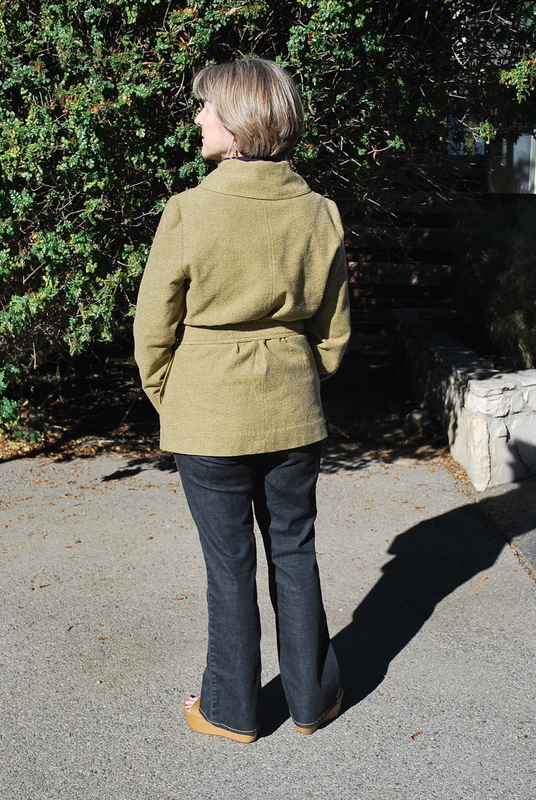 This is an unstructured, unlined jacket and does not require any advanced tailoring techniques, but successful execution the collar, set-in sleeves, top-stitching, etc…does require some intermediate sewing skills. 2. YAY! In this pattern, I’m a “S(8 -10)” If you have read my Jean Skirt post, you will know that my bottom half measurements literally translate to a size 16/18! I’m a bit pear shaped, but if you see me walking around town, I don’t look THAT out of portion. So again, they are only numbers! 3. I made a few adjustments to the pattern. First, I discovered when I began working on the collar that one side was about one inch longer than the other! I thought this was the oddest thing ever. I then studied the illustration on the pattern envelope, and it does show one side longer! I am not opposed to asymmetry, but in this case, the difference was too slight as to look like it might be a mistake. Besides an asymmetrical collar was not what I had in mind, so I trimmed the longer side and made them even. 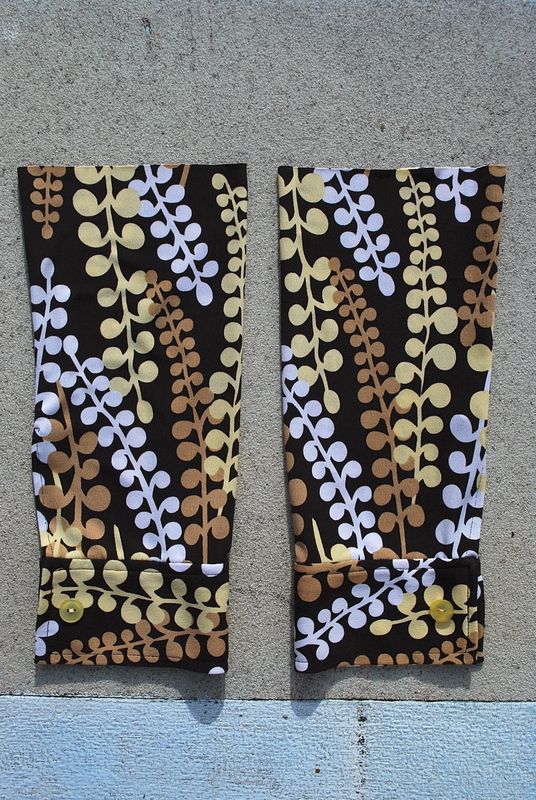 Second, I shorten the sleeve on the pattern piece about 3/4″ before I cut it out with the fabric. 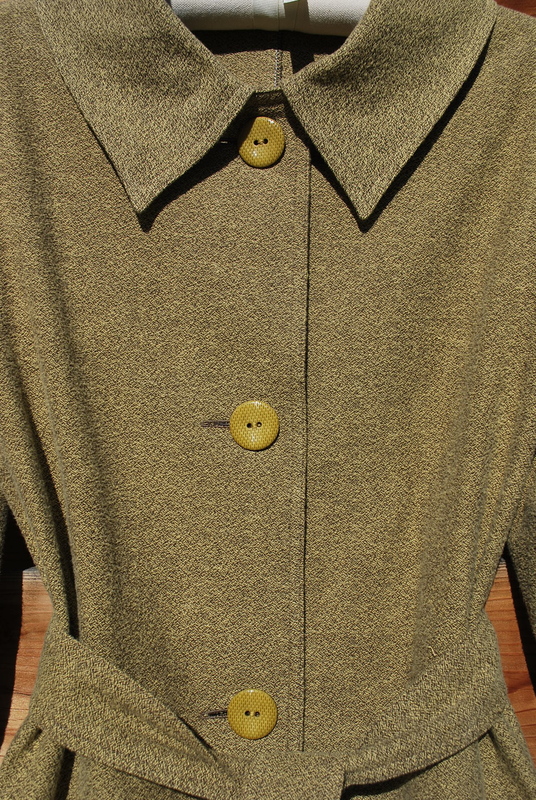 Third, I put buttons on instead of toggles. 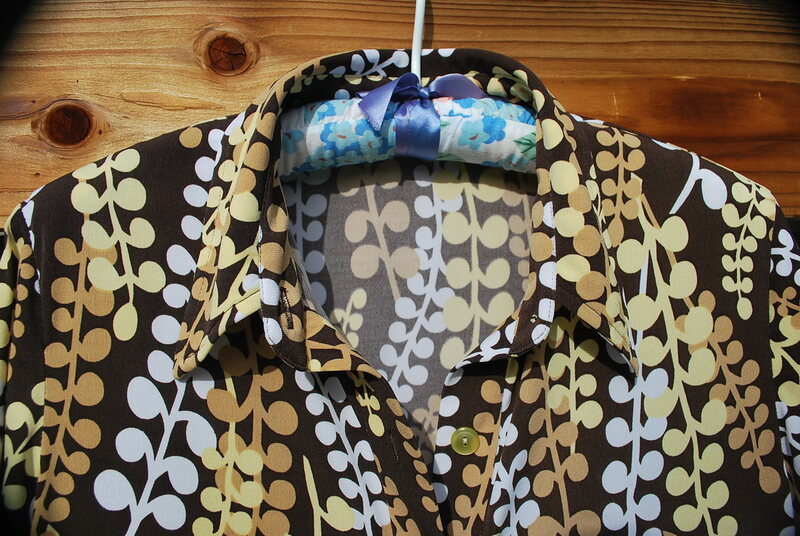 Last, I made a 2″ hem instead of the 1 1/4″ width indicated on the pattern. Overall, I am super happy with my Tina Jacket. Thank you for taking the time to read this post. I welcome your feedback! 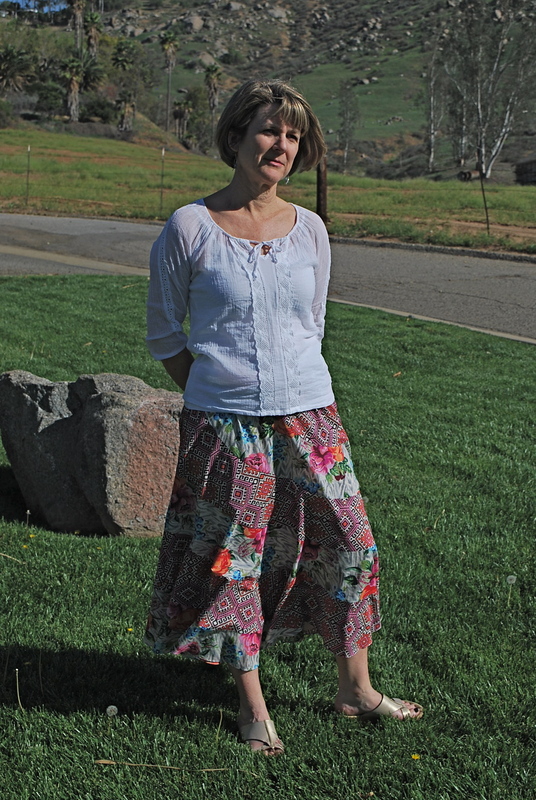 I am filled with excitement as I write my first post on my new blog, “Sewing Myself Stylish.” For my first of 24 projects, I stitched up a simple skirt. 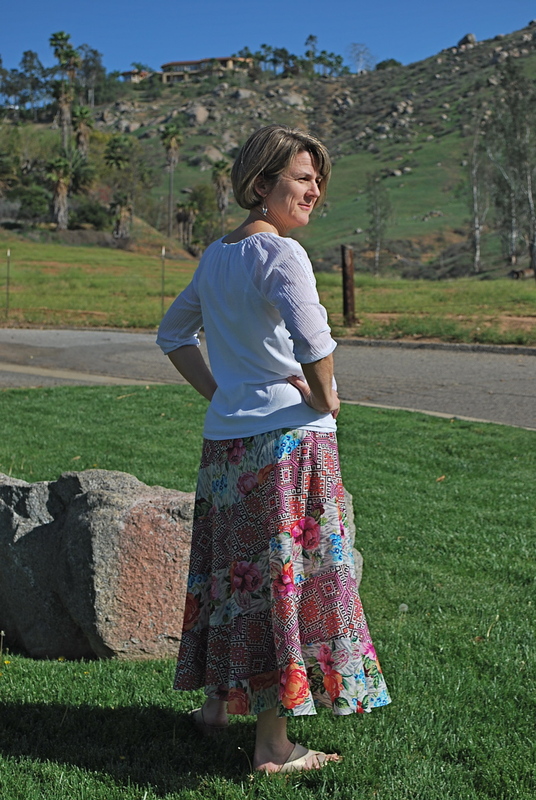 I was tired of pulling on one of the same four pairs of jeans every day, so I wanted to make a skirt that was as easy and comfortable as a pair of jeans. 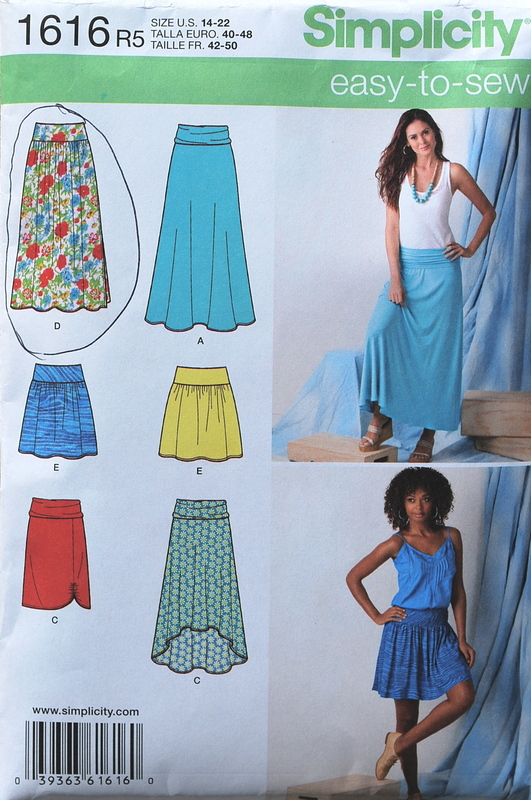 The pattern I used is Simplicity 1616 which I bought at JoAnn’s sometime last year for $1.00 in their 5-Patterns-for-$5.00 sale. I like to think of myself as a modern sewist. 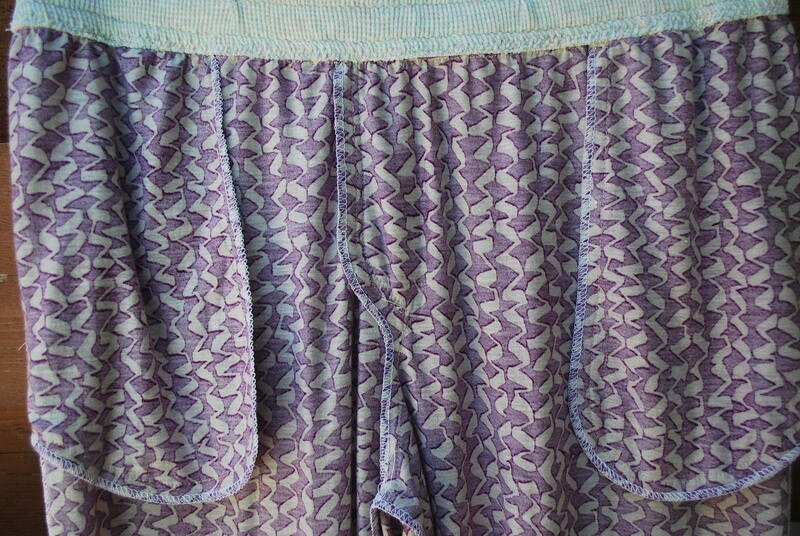 Modern sewists use indie patterns that have names instead of numbers. So I’m going to rename this pattern “The Jean Skirt” because it as easy to wear as your favorite pair of jeans! 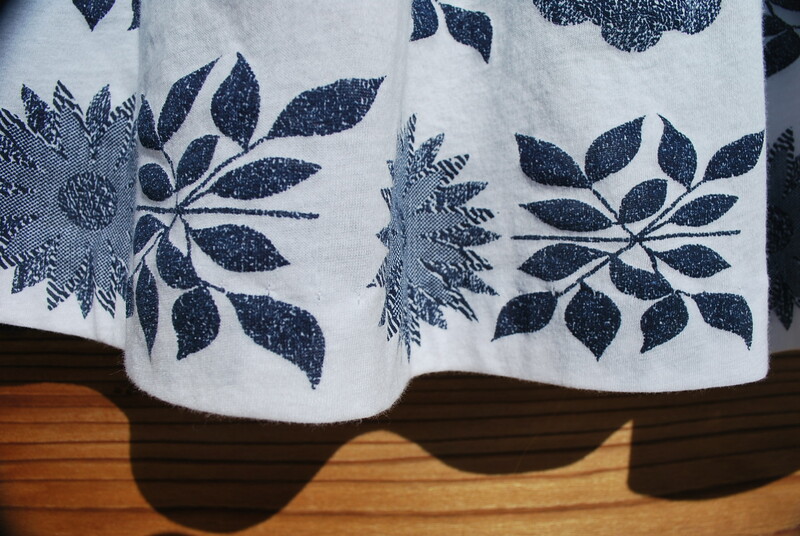 I choose this knit fabric because I liked the graphic floral pattern, and I liked that it was navy blue and white which really acts as a neutral and can be worned with just about any color of t-shirt. 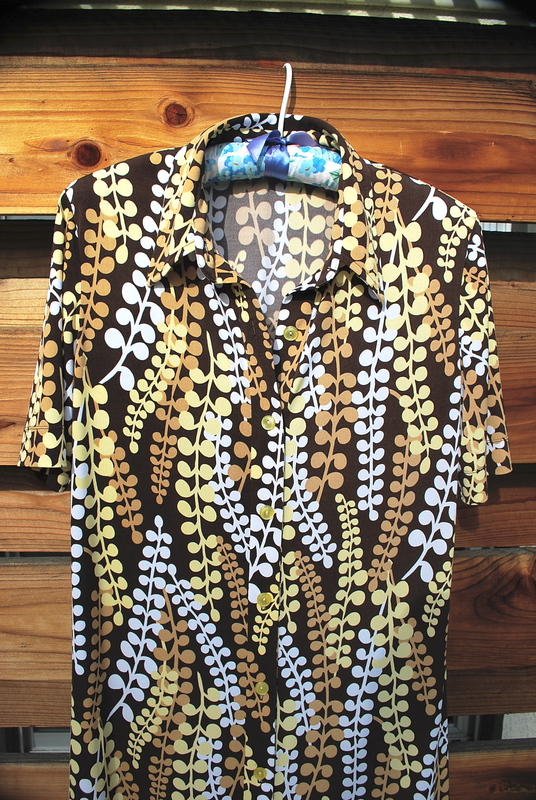 What I like about this pattern is that it’s not form-fitting, nor is it too full. It also has a 6 inch yolk/panel that eliminates fullness around the belly and allows t-shirts to lay flat. Don’t we all want that! There is an elastic casing at the waist. Here’s a peek at the inside. I overlocked all edges. 1. I have a lot of experience sewing with knits, so I have probably made this look easier than it might really be for someone who isn’t familiar with knit techniques. I am happy to share my techniques or answer your questions anytime. Just ask! 2. I am not revealing my online fabric source for this project. While I was happy with the result of my project, I was actually disappointed in the fabric. It is much thinner than I expected and it is printed off-grain. Since the flowers are a grid design, I spent a lot of time manipulating the fabric to keep the rows of flowers lined up way that was minimally acceptable to me. I still like this online fabric company and I’m not writing this blog to give negative reviews, so I will just leave them un-named. 3. IT’S JUST A NUMBER! If you’ve read my About Page, you will know that I haven’t sewn for myself in a long time. When I use to sew a lot for myself back in the day, I was 15 to 20 pounds less, and in turn my measurements were less too. 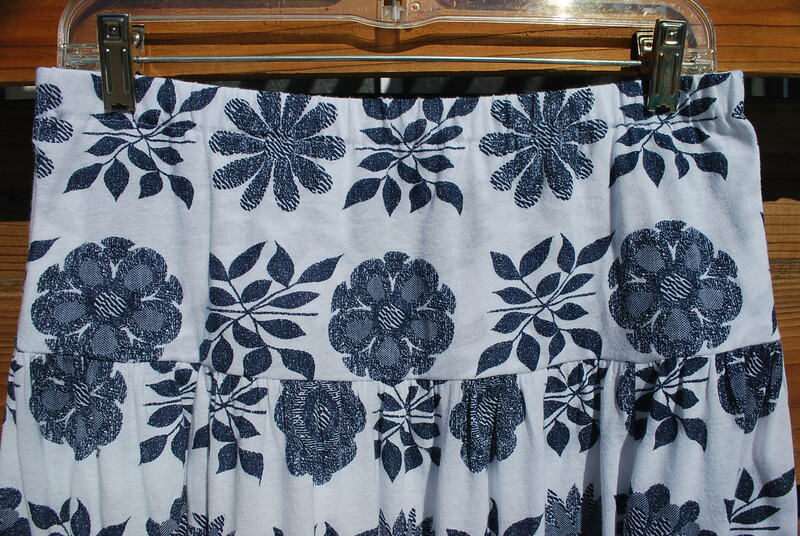 I use to make size 12 skirt patterns, and that sounded huge back then, especially when I wore a 6 or 8 in readymades. Well, now, if I directly translate my current waist and hips measurements on the pattern envelope to a size, I’m between an 16 and an 18! Gulp! In readymades, I wear an 8 or 10. I can see that these number discrepancies might set a beginning sewer up for a fitting disaster if she just cuts the “size” that she thinks she is, rather than actually measuring the actual pattern pieces against her actual measurements. 4. I made three adjustments to the pattern. First: The “yolk” was 7″ inches long and I shorten it to 6″. I felt it would match the length of my t-shirts better. Second: I eliminated a slit on the side. Since the fabric was thin, I knew I would have to wear a slip. Yes, a slip. Remember those? I knew that a slip would show if it had a slit. Third: The instructions said to “float” the elastic in the yolk. This sounded strange to me, so I stitched a casing at the top just wide enough for the elastic. Thank you for taking the time to read about my first “Sewing Myself Stylish” project. I can’t wait to get started on the next one! I welcome your feedback.